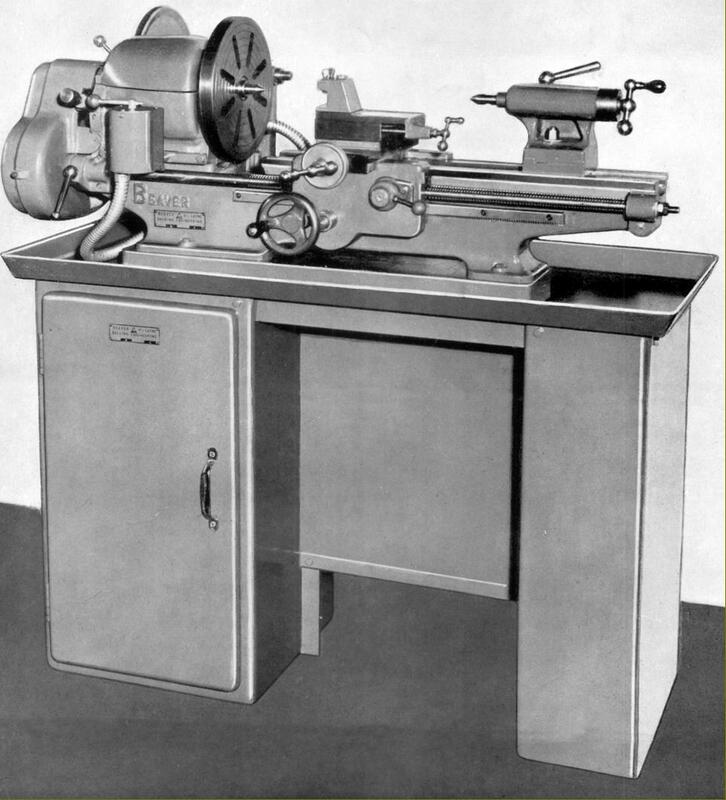 Only one conventional lathe was manufactured by Norfolk-based Balding Engineering - a company that became famous for their range of ram-head milling machines - the "Beaver Model A" Introduced during 1951 and made in very limited numbers (probably fewer than 50 being sold) this 4.5" x 20" lathe was a backgeared, screwcutting model of conventional design but very strong (260 lbs) construction, well specified and obviously designed to last. 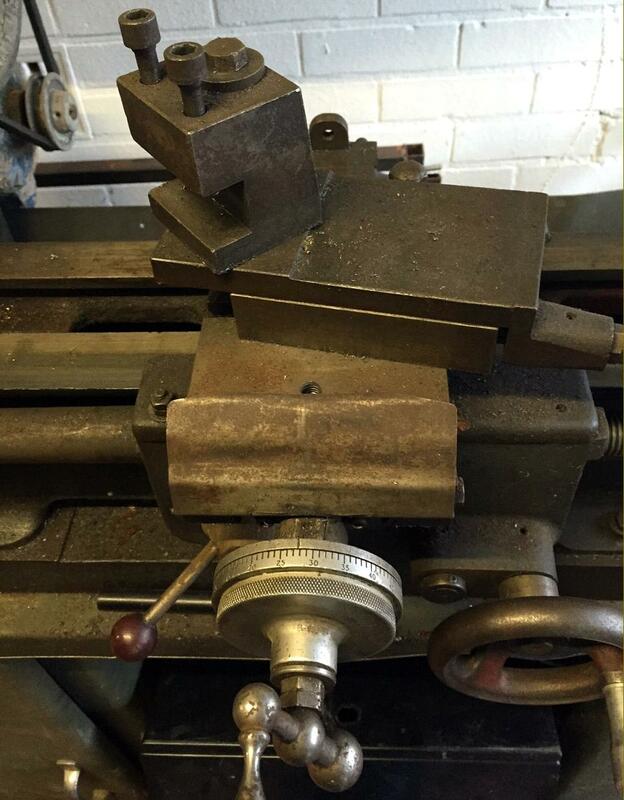 Of robust proportions the headstock spindle had a nose thread of 1.75" x 7 t.p.i., a No. 4 Morse taper socket and was able to pass a 1" diameter bar. Bearings wereplain bronze, the front 1.875" in diameter and 2.25" long and the rear 1.37" x 1.375" with a ball-bearing race to take end thrust. Flat-topped with 60° V-edged sides, the 40-inch long bed was 7 inches deep, 5 inches across the top and equipped with a rather narrow gap that allowed work up to 25" inches in diameter and 2.5 inches thick to be turned on the faceplate. A 4.5" x 8.25" T-slotted cross slide was part of the standard specification, as was power cross-feed - this giving a travel of 5.75 inches. The cross-feed screw was of Acme form, 0.5" in diameter and equipped with thrust bearings for facing in either direction. The bronze nut was a generous 1.25" long and the satin-chrome plated 3-inch diameter micrometer dial (with a knurled rim for better grip) unusually large for this class of lathe. Although a generous travel of 4 inches was provided for the top slide the 0.5" diameter feed screw - very oddly - lacked a dial. 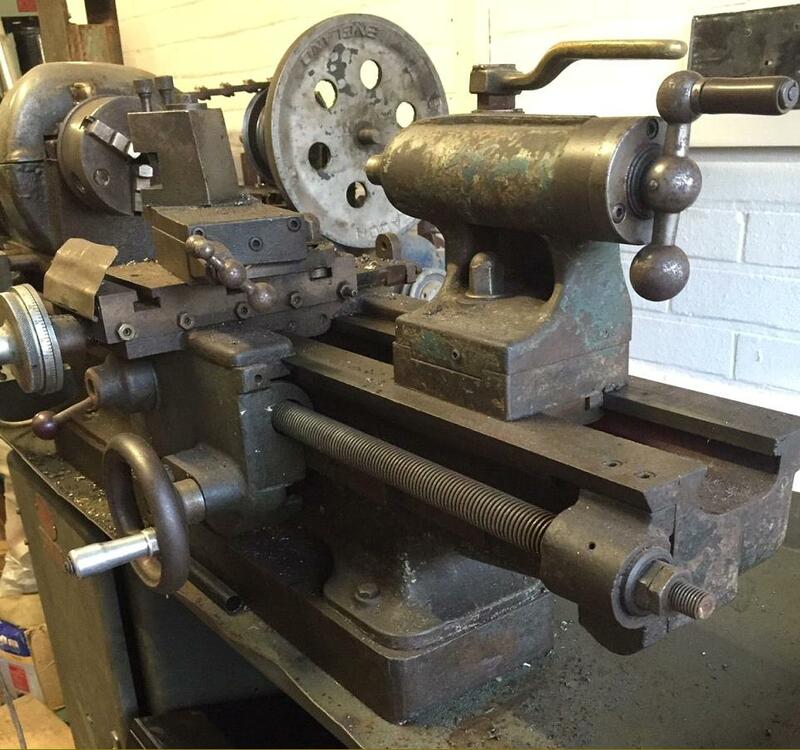 Unfortunately the apron power feed mechanism was confined to the cross direction, the sliding feed being provided exclusively by the screwcutting mechanism, a design that ensured the clasp nuts would be worn out in regular work instead of being saved for screwcutting. Hand drive of the carriage was by a full-circle handwheel, fitted with a rotating hand grip in horn, with enclosed reduction gearing in the apron between wheel and bed rack enabling the operator to give a slow and steady feed. Drive came from a neat, all V-belt drive motor countershaft unit bolted to the stand behind the headstock. Eight speeds were provided: 220, 338, 490 and 685 r.p.m. in direct drive and 34, 56, 80 and 120 r.p.m. in the 6.5: 1 ratio backgear. Although no evidence can be found of what the standard motor specification might have been, it is likely to have been a 1 h.p., 3-phase running at 1425 r.p.m. A set of 14 changewheels was provided for screwcutting (there was no gearbox option listed) these being encased within a neat cast-aluminium cover and driving the 7/8" diameter, 8 t.p.i. leadscrew (fitted with a ball thrust race) through a conventional tumble-reverse mechanism to give a range of pitches that spanned 4 to 60 t.p.i. In order to provide an extra-fine feed an 80t gear was provided, this giving a carriage-travel rate of 0.0021" per revolution of the spindle. Bored No. 2 Morse taper, the 1.125-inch diameter tailstock spindle was driven by an Acme-form 1/2-inch diameter feed screw equipped with a ball thrust race, that acted to self eject the centre. A rather fine touch was the fitting of a rotating horn handgrip of the "balanced" drive wheel. 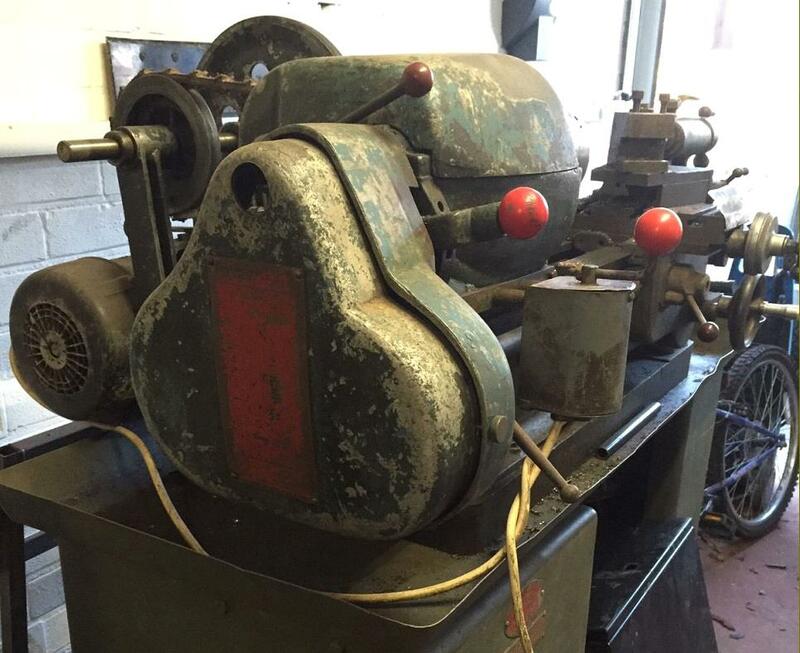 The upper section of the tailstock could be set over 1/2" either way from central for the turning of slight tapers. If any reader owns one of these machines, or has any advertising or technical literature about them, the writer would be very interested to hear from you..